Transitional millisecond pulsars (tMSPs) have emerged as a new class since the discovery of the first such system over a decade ago. These systems switch between a rotation-powered state and an accretion-powered state, and provide clues to understanding the physical processes that spin-up neutron stars to millisecond periods. Recently, astronomers analysing simultaneous data obtained using the William Herschel Telescope (WHT) and the Gran Telescopio Canarias (GTC), have been able to model the observed light curves and conclude that the accretion of clumpy material through the magnetic barrier of the neutron star can produce the observed near-IR/optical variability and correlations. In the rotation-powered state, these systems have high radio luminosities and the neutron star is detectable through its radio pulsations as a millisecond pulsar (MSP). In the accretion-powered state, no pulsations have been detected at radio wavelengths, and the systems is much brighter at optical and X-ray wavelengths due to the presence of an accretion disc. PSR J1023+0038 was the first member of the tMSPS to be discovered. Although it was originally classified as a cataclysmic variable (a binary star system with a white dwarf primary), in 2007 the system was detected as a radio pulsar with a spin period of 1.69 ms, and hence it was reclassified as an MSP. PSR J1023+0038 transitioned from a rotation-powered to an accretion-powered state in 2013 June and has remained in this state so far. In 2017 astronomers determined the timing properties of PSR J1023+0038 using data taken simultaneously with ACAM on the WHT and CIRCE on the Gran Telescopio Canarias (GTC), when the system was in the accretion-powered state. The light curves, covering 14,000 s, showed rapid transitions, similar to the X-ray mode-switching behaviour observed previously. Example 2000 s sections of the simultaneous ACAM+WHT optical (blue) and CIRCE+GTC near-IR (red) light curve of PSR J1023+0038. Positive and negative correlations between the two lightcurves can clearly be seen. Credit: Tariq Shahbaz (IAC). Large format: [ PNG ]. The high-quality light curves taken at a resolution of 6 seconds were crucial in determining the cross-correlation function between the optical and near-IR light curve. The cross-correlation function, which determines the time delay between similar structures, revealed key features that could not be explained by simple X-ray reprocessing models. Indeed, the features observed were indicative of at least two separate processes superposed in the light curves. 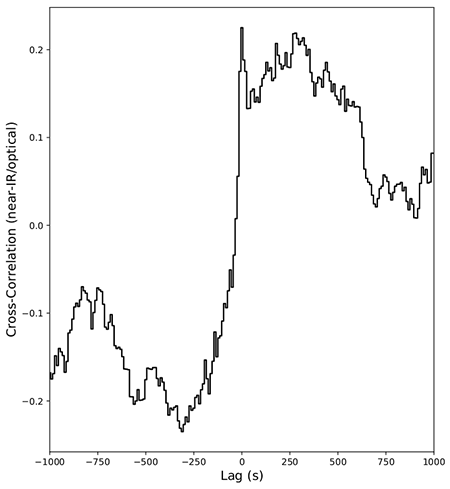 The cross-correlation function between the simultaneous near-IR and optical light curves as a function of time delay. A strong, broad negative anti-correlation at negative lags, a broad positive correlation at positive lags, with a strong, positive narrow correlation superimposed is observed. Credit: Tariq Shahbaz (IAC). Large format: [ PNG ]. The team proposed a model in which the accretion in the system proceeds through the occasional penetration of the clumps/blobs of plasma through the magnetic barrier. In the model the optical emission is dominated by the X-ray reprocessed component, whereas the near-IR emission contains a component due to the emission from plasmoids in the hot accretion flow and an X-ray reprocessed component. They explained the rapid transitions as being due to the penetration and expelling of the blobs of synchrotron emitting plasma fed by the hot inner flow. As the plasmoids are expelled by the rotating magnetic field of the neutron star, there is an increase of the synchrotron near-IR emission. The features in the correlation function were explained by the suppression of the near-IR synchrotron component in the hot inner flow, and the increased synchrotron emission of the outflowing plasmoids. The conclusion is that the accretion of clumpy material through the magnetic barrier of the neutron star can produce the observed near-IR/optical variability and correlations. T. Shahbaz, Y. Dallilar, A. Garner, S. Eikenberry, A. Veledina, P. Gandhi, 2018, "Evidence for hot clumpy accretion flow in the transitional millisecond pulsar PSRJ1023+0038", MNRAS, 477, 566 [ADS].